J Boog, born in Compton, California and now splits time between the Golden State and Hawai’i; after a relentless run of tour dates in 2015, has recently announced his 2016 touring schedule for the United States. 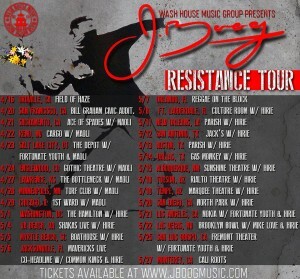 Quite fitting, J Boog will begin his The Resistance Tour dates on April 20, 2016 in San Francisco, CA at the Bill Graham Civic Auditorium. Lucky enough for fans in the Bay Area, the venue holds over 7,000 fans, and will need every single seat in the house with the massive one-day lineup of Cypress Hill, Chronixx, Juicy J, Berner and the aforementioned J Boog. Following the April 20th Festival in San Francisco, J Boog will begin a string of dates throughout the country with stops in Sacramento, Colorado, Kansas, Minnesota, Chicago, Washington, D.C., Virginia Beach, Myrtle Beach, Orlando, Ft. Lauderdale, New Orleans, Texas, New Mexico, Arizona, Las Vegas and three shows in Southern California to conclude the month long tour in the spring. Before J Boog performs in the United States in 2016, the reggae artist will be touring through Australia and New Zealand in February, including a headlining performance at New Zealand’s One Love Festival on February 6, 2016. Fans can expect to hear their favorite tracks and live staples that J Boog’s live performances are renowned for, but don’t be surprised if the singer reveals a few new, unreleased songs in his live set this tour. There is much anticipation for a new album from J Boog in 2016. At the end of 2015, J Boog and Stephen Marley released a collaboration on a song titled, “Good Good Feeling”, which is slated to be one of the tracks featured on the forthcoming release Wash House Ting. The upcoming tour dates will feature special guests Third World in New Zealand and Australia, while Maoli,Fortunate Youth and Hirie will provide direct support on select dates throughout the United States tour. For more information on J Boog, the upcoming album release details and a full list of tour dates, follow the links below.